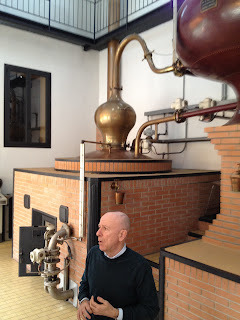 When an invitation to visit a local Brandy distiller on the outskirts of Bologna, Italy came up last week I almost did not go. Italian Brandy? Unheard of! Then my friend assured me that this was the finest brandy in all of Italy...and then somehow my afternoon magically rearranged itself to allow this trip to be taken with ease...so why not I thought? It turned out to be a highlight of our trip, and as for that bold claim? 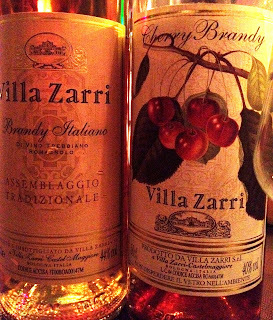 I now believe it to be one of the best brandies not only in Italy but even (queue the Jeremy Clarkson voice)...in the world. 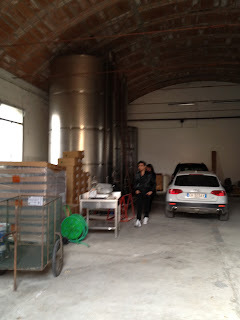 Located about 10 minutes outside of Bologna's town center in a compound dating back to 1578. The Villa was restructured in 1729 and thanks to some loving restorations over the years it looks much the same today as it did in the eighteenth century. Guido Zarri's family has been working with brandy for three generations starting with his maternal grandfather Leonidas Zarri. 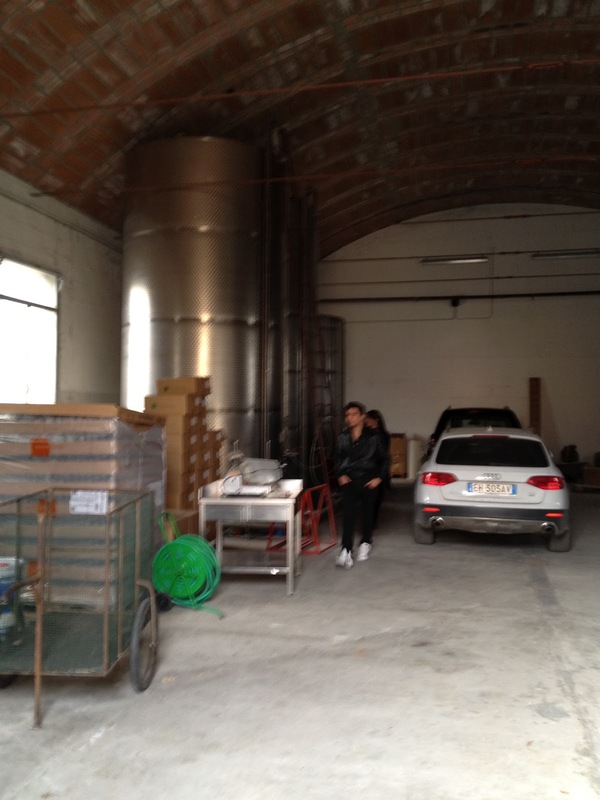 They purchased the Pilla, a small company based in liquor Murano (Venice). The company was later transferred to Castel Maggiore (Bologna) and under the guidance of his father, Guido made a very important development with the Brandy Oro Pilla. 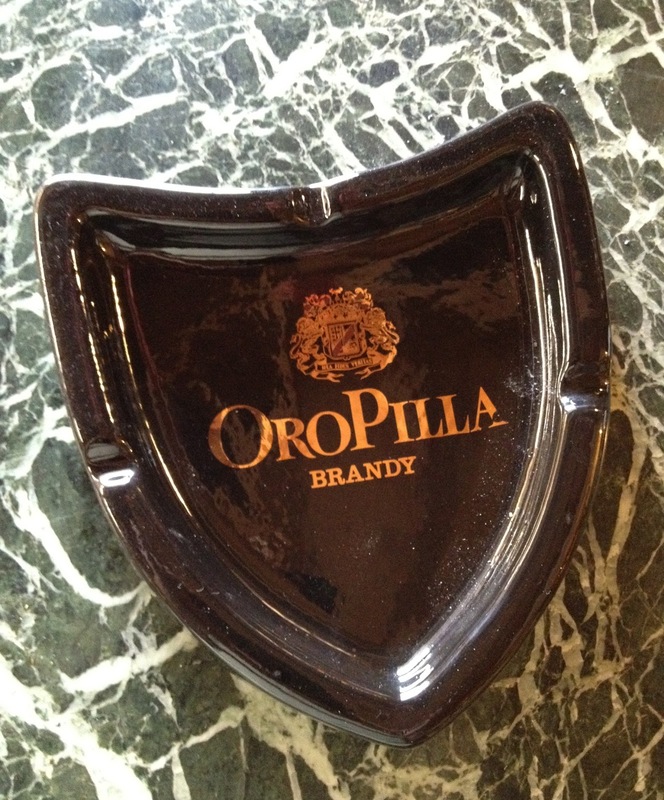 He went into business in the late 70's and sold the brand Oro Pilla to Amaro Montenegro in 1988. The old Oro Pilla distillery located next to Villa Zilla. 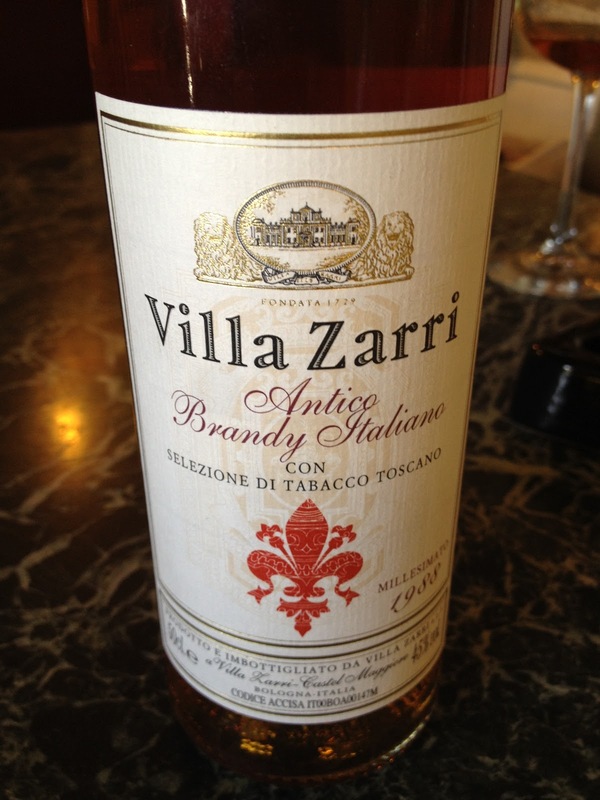 In 1986 he started a small production of Brandy Cognac inspired by the goal of creating in Italy, a Brandy DOC. Keeping his small distillery in Villa Zarri, baptized by the name of the old house that lies in front of the distillery, he turned to craft production as a passion project to produce a Brandy which over the years has become increasingly valuable (and good!). 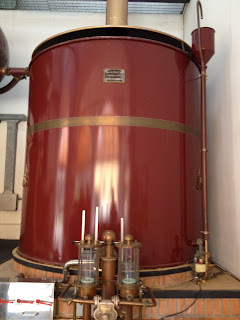 This vessel is used to preheat a batch of wine to speed the distillation process. 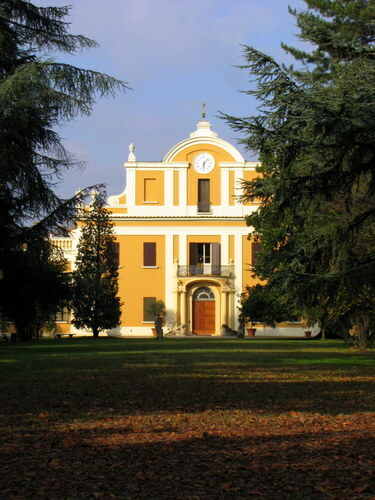 Starting only with fresh white wine made from the Trebbiano grapes grown in the local Toscano and Romagna regions, the Villa runs 24/7 during harvest season. Wine in brought in by truck from local producers and stored in these large stainless steel vessels. 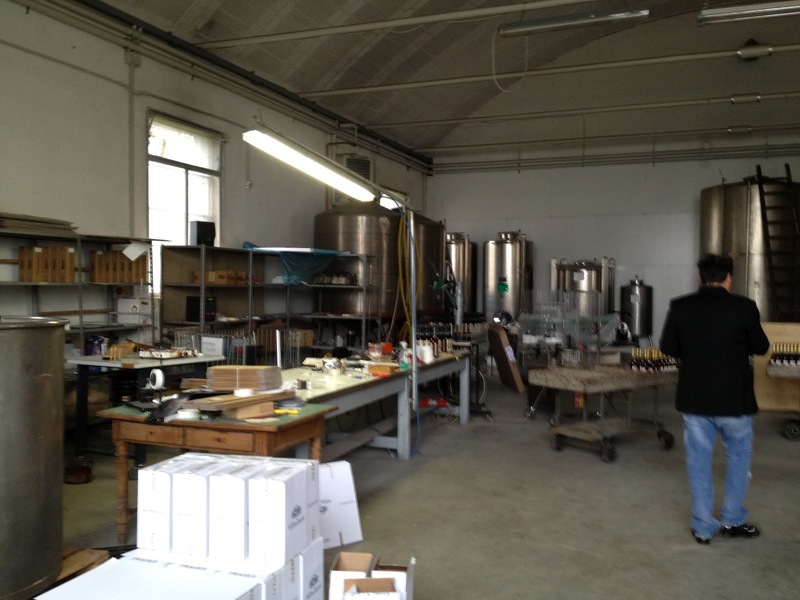 Each batch is started by boiling approximately 7500 liters of fresh wine with an A.B.V. of approx 10%. Since the alembic's boiler holds only 2500 litres it takes 3 batches of the first distillation called the "blank" which has an ABV of around 30-35% to make one full batch (approx 700 litres) of the "aquavite de vino" which has an A.B.V. of approx 70%. The condenser cools the alcohol vapors collected from the boiler very slowly and gently. 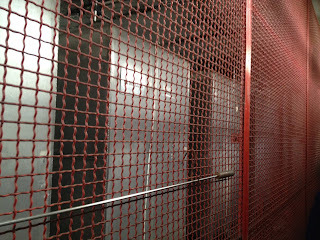 The aging process results in a net loss of approximately 3% of the total amount of liquid produced per year. After 10 years 30% of the original liquid has been lost to evaporation, a.k.a. the "Angel's Share". So for every 7500 liters of wine they start with, to produce a 10 year old vintage they only net approx 450 liters of aged brandy. A 20-22 year vintage, only half of that. This is why good brandy is so expensive! 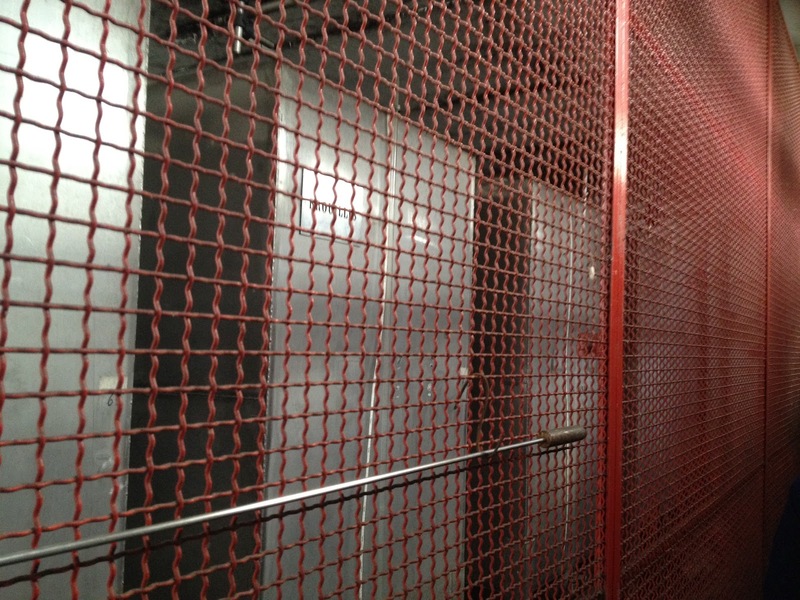 The stainless steel holding tanks, each hold approx 5,000 liters. As each batch is distilled, the heads (the first part of the run) and tails (the end of the run) are saved in separate containers to be used later in proprietary ways to enrich the flavors of the final product. 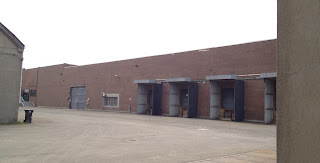 These containers are kept behind the steel fence in the photo above, and not accessible without the presence of the proper official, so at the wrong time of day even a small equipment failure can cause large disaster! The aging process begins in (new) 350 liter barrels of French oak from the forests of Limousin and dell'Allier. When the brandy is aged in new oak for that first year, it absorbs color, tannins and aromas from the wood. The origin of the oak makes a large difference. For example, the forests of the Limousin are predominately Farnia oak which have a coarser grain and are richer in content of phenol's like catechinic tannins. Oak from dell'Allier has finer veining and is rich in vanillin. The Allier oak, with it's slower growth rate, has a fine, close grain which isolates the aging liquid from the outside environment to a greater degree than the relatively wide grains of the faster growing trees from Limousin. This is fine for wine but spirits need to breath more as they age than a wine does. This is why they use both woods, to get the best of both worlds. When taking Bologna's idea microclimate for aging spirits into account, this access to the outside world becomes key. Bologna's gentle seasons provide just enough change in temperatures to really allow the spirit to take deep long breaths each year as the cold air contracts the liquid into itself and the hot season pushes it out. After the first year it is racked into depleted barrels (which have been used for more than 4 years) and left there for the rest of the aging period. In the old barrels, through the pores of the wood and "breathe" of the seasons, the brandy loses alcohol, absorbs oxygen and develops its true flavors. 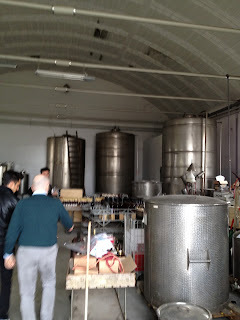 Guido showing us some of the new high-end bottles they are using for their current vintages. This phase is very slow. It takes a great many years to evolve and get a great Brandy distillate. Guido insists that his Brandy is totally natural and does not add coloring, flavoring or sweeteners. 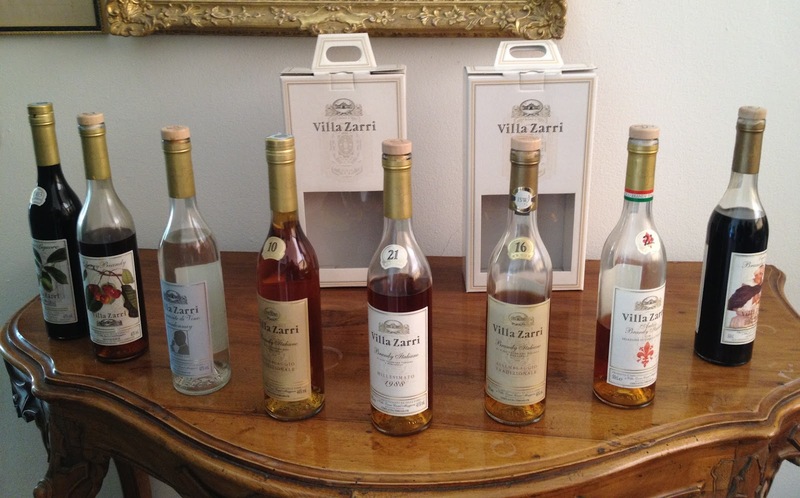 All Villa Zarri Brandies are aged a minimum of 10 years. A selection of Villa Zarri Brandies in their tasting room. The range currently includes a 10 year, 18 year, 21 and 22 year releases as well as a range of (naturally) flavored brandies including a walnut liqueur, a cherry brandy and a coffee brandy. Especially well suited (and desirable) for cocktail mixing is the cherry brandy. Their cherry brandy is made using both sour (durone della marca) and sweet (nero secondo) cherries which are steeped in the brandy for two full months creating an amazingly deep and rich cherry brandy (yet it is also somehow very light!) - with all natural ingredients. Simple and elegant it's perfect to sip on its own, but will lend itself well to classic cocktail recipes. 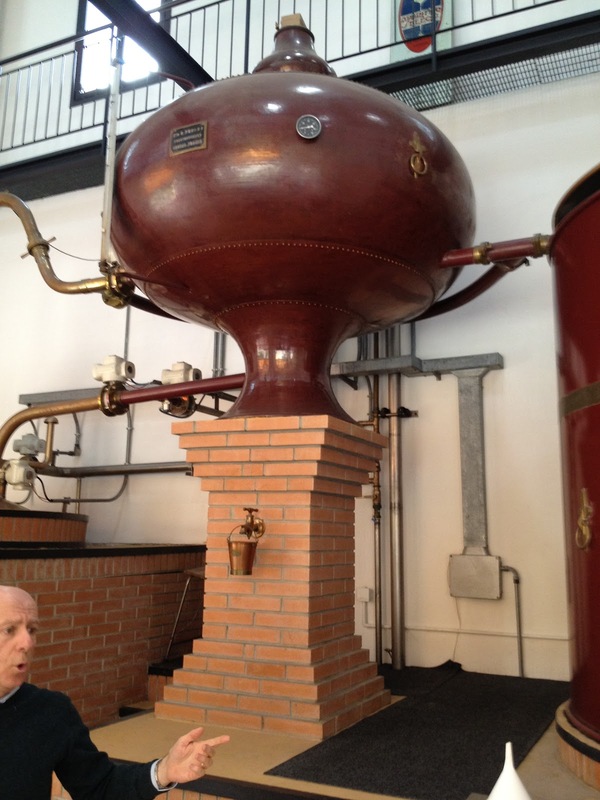 This is truly how cherry brandy would also have been made "back in the day". The producer describes the expression as being "Clear and warm, refined with a bright amber color. Elegant and aromatic nose with a very fine smell of sweet spices, cinnamon, vanilla, grapevine flowers and cloves. 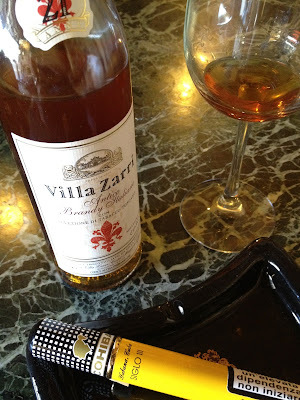 On the palate this brandy is full, warm, spicy and fresh." They also caution moderation as it does contains nicotine! NOSE: Tobacco right there in the top, big and bold! Underneath though I found the notes of the cinnamon and vanilla, even a hint of the clove. This is a strong Brandy at 90 proof and that heat comes through on the nose, though not unpleasantly so - there is a softness there too for such a strong spirit. Full of character and inevitably met with a "wow!" and a quick second whiff. 23/25. Here is an interesting read from the NY Times that originally appeared on November 3rd, 1853. The writer has an obvious, and often humorous, temperance bent to their prose. All the same, the article is extremely descriptive and paints a vivid picture of what stepping into a New York bar in 1853 was like. 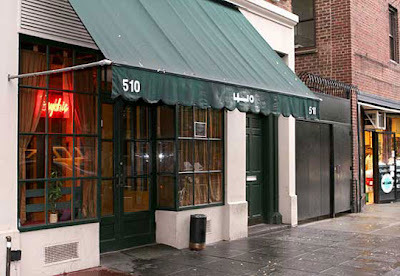 I had a great time checking out new places in NYC last week. Toy Fair, Fashion Week, and bevy of all-new places to try out, it all made for an extra good time! 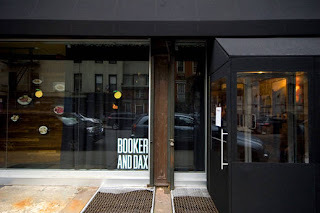 First stop was booker and dax which is located adjacent to momofuku ssam bar in milk bar's old location (milk bar moved to a new space directly across 13th street). Momofuku restaurant group owner David Chang and molecular gastronomy wizard Dave Arnold put this program together and I have to say, they are off to a great start! 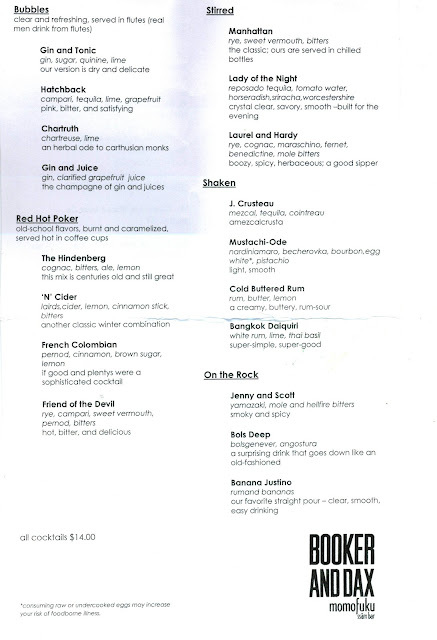 BOOKER AND DAX's inaugural cocktail menu, February 2012. The first column is the unusual bit. 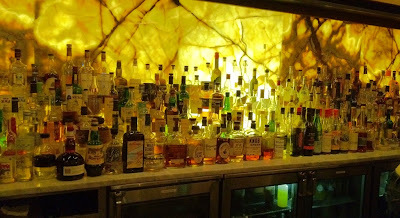 "Bubbles" which are house-prepared, pre-mixed and bottled-cocktails which are then hand carbonated on-demand. Because they carbonate the entire cocktail, rather than adding a carbonated beverage to the mix, the mouth-feel on the carbonation is unusual. Big, round bubbles that feel like pop-rocks going off in your mouth. Well, almost like pop-rocks! It was my first cocktail of the trip so I started with the Manhattan. It was a very solid classic served in a small coupe with enough extra liquid to fill the glass about half again served in a small glass bottle on the side. It was served very cold mind you, the glasses are chilled using liquid nitrogen! It was very refreshing and absolutely hit the spot after a long day of travel. 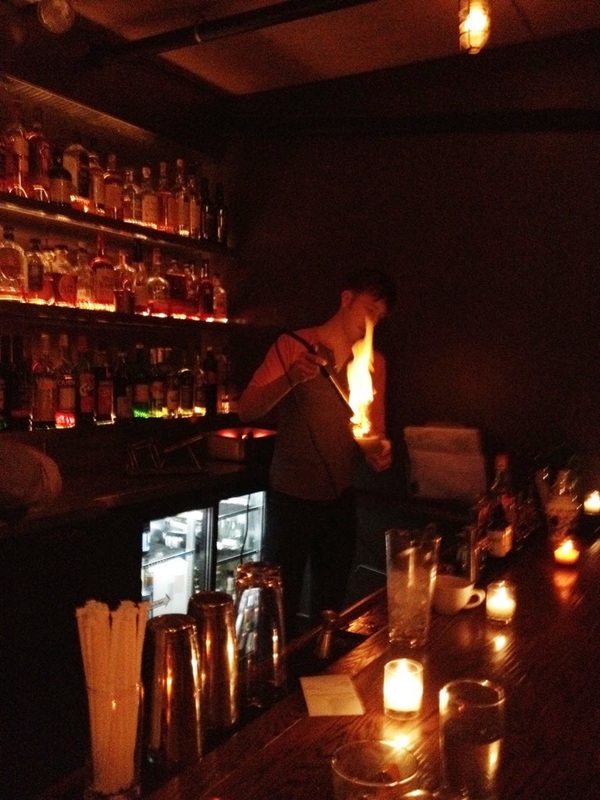 Here's bar manager Tristan Willey showing us the electric hot poker in action! A main attraction here is certainly the "Red Hot Poker" which is especially fitting for their winter launch. The poker was created by Dave Arnold and reaches temperatures around 1500°. Like the red hot pokers used in colonial days to make hot rum flips and their ilk, the poker is heated (electronically) to the point where the tip is glowing red hot. It rests on the bar off to the side in a protective cradle. When the poker is used to heat up one of these drinks, flames shoot up as high as two feet above the glass creating an entertaining light show. This is more than just a gimmick though, it's a serious tool. 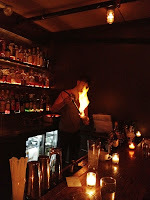 OK, granted it should not take long for the "Flaming Moe" jokes to start, but the resulting concoctions made me a believer! 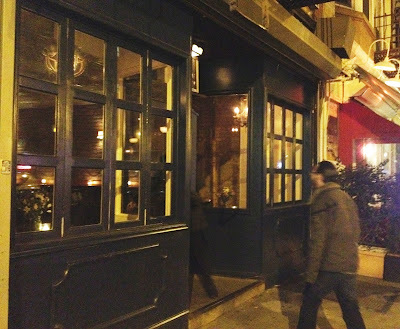 We tried the "'N' Cider", "Friend of the Devil" and the "French Colombian" this visit. The 'N' Cider is a classic winter warmer. The flaming process tamed the normally hot and hard-to-tame Laird's bonded down quite a bit. The softened apple whisky combined with the lemon, cider and cinnamon made for an exceptionally good toddy. Back Bar at Booker and Dax, note the "Red Hot Poker" in lower right corner. The hot Campari in the Friend of the Devil was a new one for the group and we all agreed it changed the flavor quite a bit. The touch of pernod seemed just right. It was a bit all over the place on the palate, sharp and smooth, bitter and just a touch sweet. Unusual and enjoyable. The French Colombian is for Pernod lovers! I've never really liked "good and plentys" but this was good enough that even I enjoyed the result. 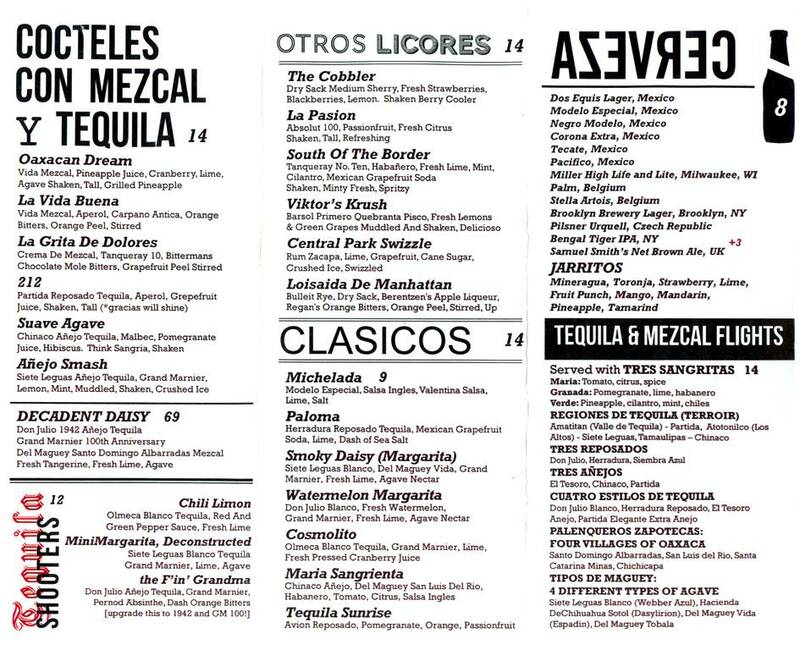 Bottom line with these drinks, the menu's description of "old-school flavors, burnt and caramelized, served hot..." is dead on. We also tried a Bols Deep. Bols Genever based old fashioned's are gaining popularity for good reason, they are delicious! The Bols Deep was no exception. Keep an eye out for these drinks this year! With a rotovap on the back bar by the till, you know this program is seriously geeky, but it is not geeky to the point of distraction. 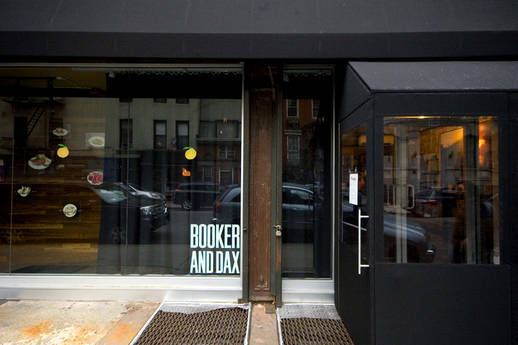 Like all of David Chang's endeavors, Booker and Dax provides an experience that is comfortable and familiar, while providing something that somehow feels completely new at the same time. Thanks again to Tristan and the crew for making us feel welcome and taking such good care of us, we had a great round of drinks! 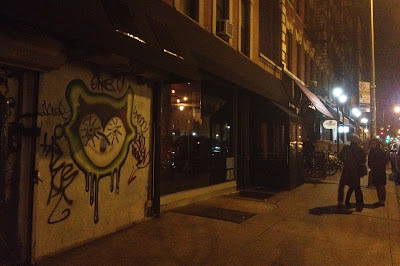 Graffiti outside of booker and dax's 13th street entrance. The address alone will only get you part of the way there. Following the unmarked-door trend prevalent in modern speakeasies, this location is marked only by the "EO" logo in the middle of the green awning in the photo above. It wasn't immediately obvious to me that I'd arrived at my destination and I had to ask the doorman if I was in the right place. He affirmed I was and invited me in. 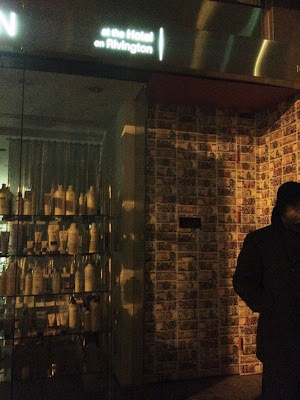 Inside, just past the psychic working a small table with tarot cards, is an art deco gem. 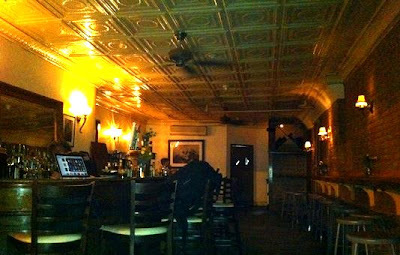 Tasteful glitz, just a tad faded, it really felt like a swank 20's speakeasy. So the Malèna, my favorite rye, with Campari and they throw in a little high-end port and orange bitters - a very nice cocktail. I tried not to drink this concoction too fast as I waited for my companions to arrive for dinner, which was not an easy task! I was able to watch Milos give instructions to the barbacks for the busy evening ahead and even sampled a few variations on a drink he was developing. Arriving early anywhere is a good call if you want to get to know a place. The staff has so much more time to spend with you before the crowd arrives and starts pushing them to their limits. Milos was the perfect host and even though I only had time for one, it was very enjoyable and I was made to feel extremely welcome. Several hours later after the big meal, we returned and Milos immediately recognized me and helped us find a few seats at the bar. It was late and we only had time for one, but I had as good a Pisco Sour as I have had anywhere and I was also able to sample their "Ruby Tuesday" (which was also very good). Before hitting the bricks we shared a round of Fernet with the staff. The trip to "EO" was very enjoyable and I would not hesitate to return. 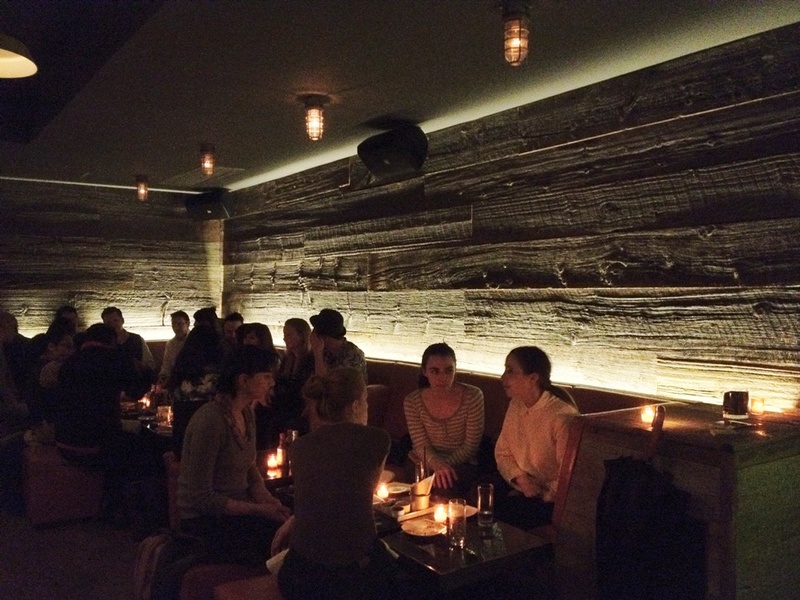 We arrived around 6:30 on a Thursday night at this neighborhood favorite and it was already starting to fill up. It took about a quarter of an hour to jockey a few seats at the bar. Once there we ordered some light plates and cocktails. 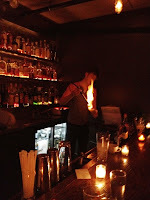 Bar manager Chaim Dauermann was behind the stick and promptly whipped us up a couple of great cocktails. The pasta dishes hit the spot, I ordered the linguine w/mussels, cherry tomatoes, garlic and wine and it was excellent, and this is a favorite dish of mine! The cherry tomatoes were on the large side and had their skins blanched off, they a nice meaty texture and a great flavor. There were pleanty of mussels in the mix and not too much butter in the sauce. Kudos to Chef Eric Kleinman for really getting this dish right! 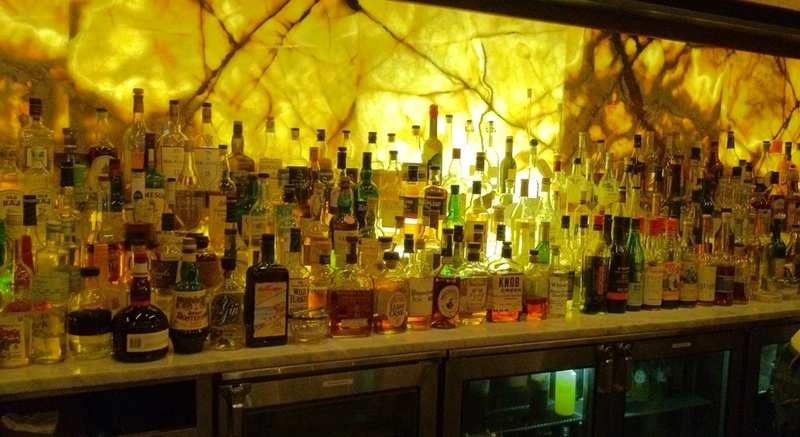 The back bar at 'inoteca liquori - an impressive collection! I ordered the Vieux Carre. Shaim put together the Rittenhouse rye, Hine H Cognac, Dolin Rouge, Benedictine (along with Ango and Peychaud's bitters). I soon received the expertly prepared classic cocktail which tasted every bit as good as it looked. Soon the place was really filling up and we had places to go, so after the quick bite and libations we were ready to move on. Thanks again to Shaim and the crew for a great experience. I'll be back! 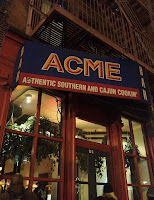 We hiked it over to Acme next and were greeted inside by a rather rude couple who immediately informed us that there was a private party that night. 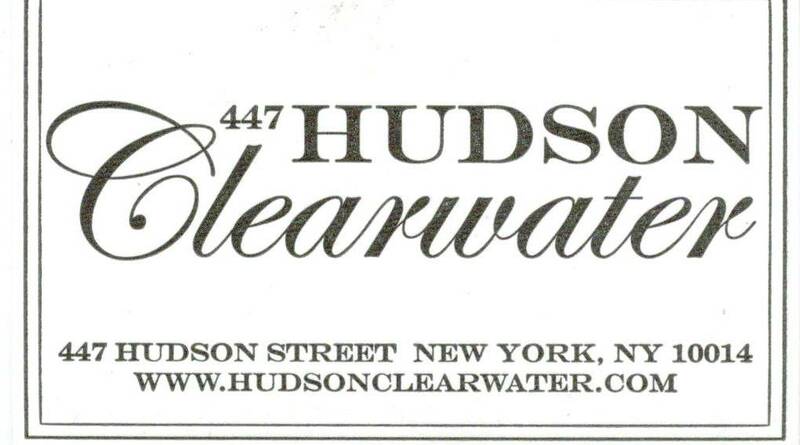 It's worth saying that there was nothing on their web site and nothing on front of building noting this. 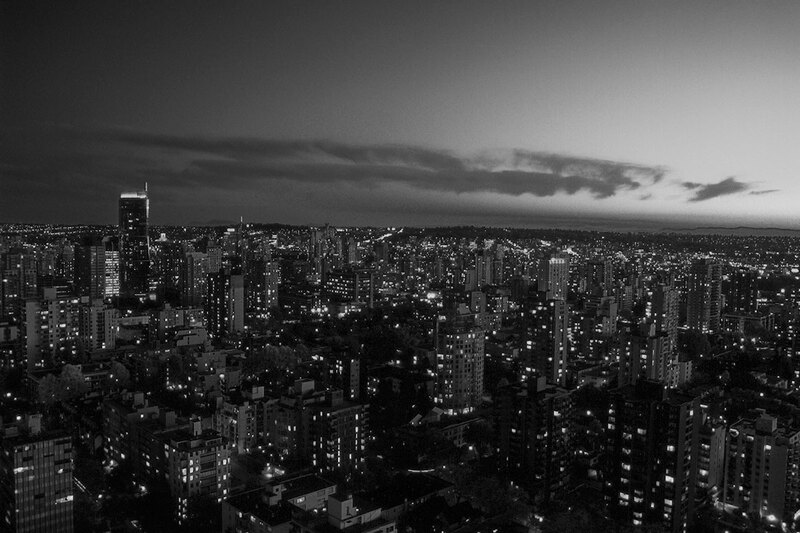 A friend I was with told me that this was the second time that he had tried to visit this place, and the same thing happened to him the first time. I really doubt I'll be back to try again. This did give us a chance to hike a little further on to Viktor & Spoils...which turned out to be well worth the walk in the rain. The wall of lit Jarritos at Viktor & Spoils, very cool. We looked at the entrance from across the street for a few extra beats before we figured out we had arrived. 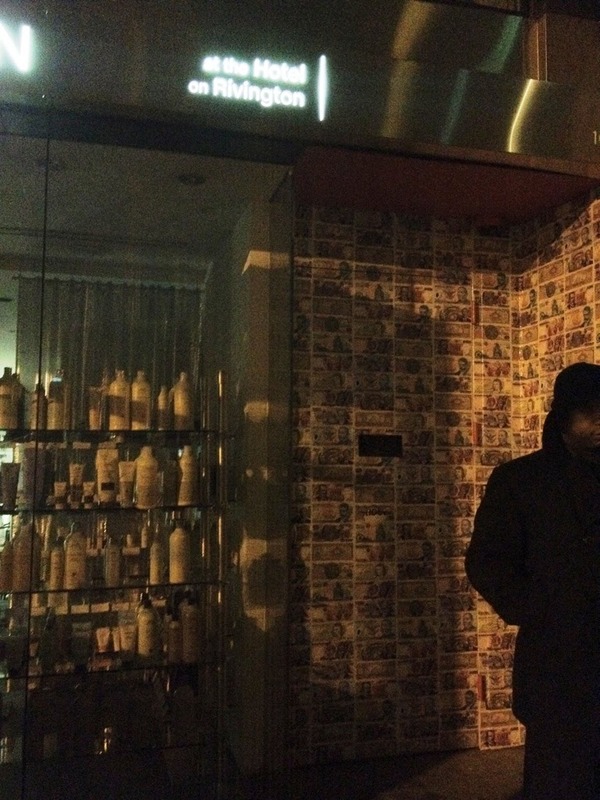 The doorman was my first clue! 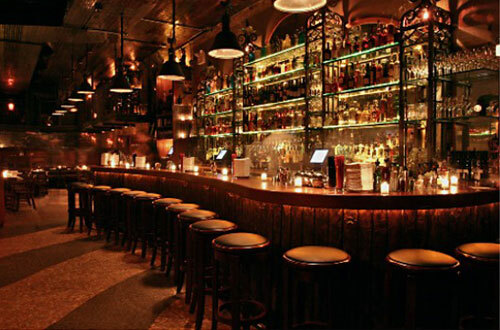 The bar is flanked by flickering candles, each candle masked with a gruesome skull. Good mojo! 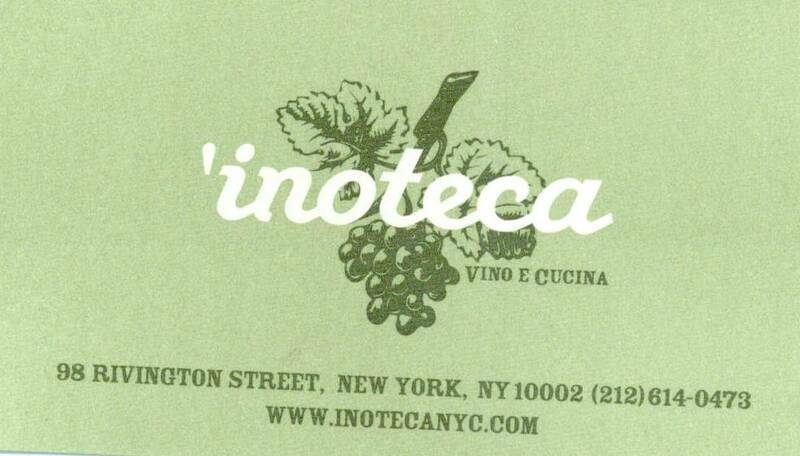 This place has a great vibe. 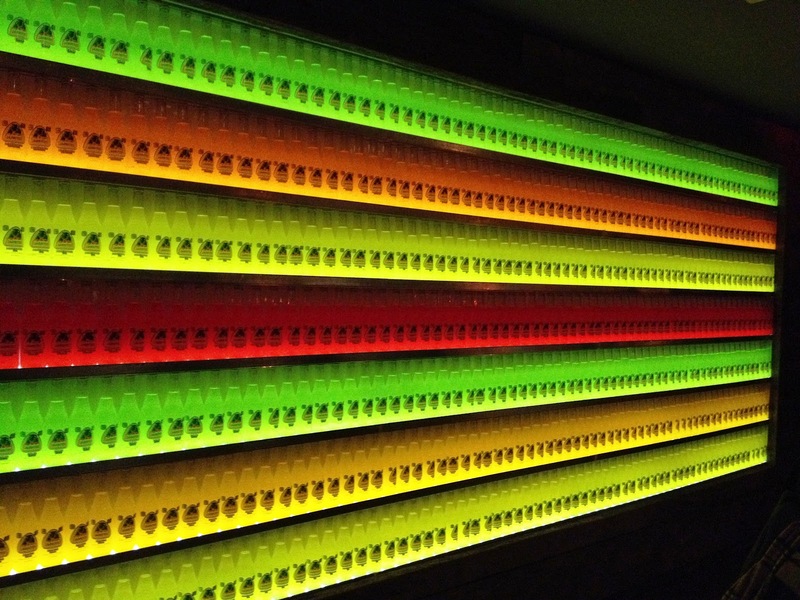 Check out the wall of mezcal and tequila, I was impressed! I started with a favorite, "La Vida Buena". A tasty mix of Vida Mezcal, Aperol, Carpano Antica, Orange Bitters, Orange Peel stirred and served up. Perfect after trekking so far west. 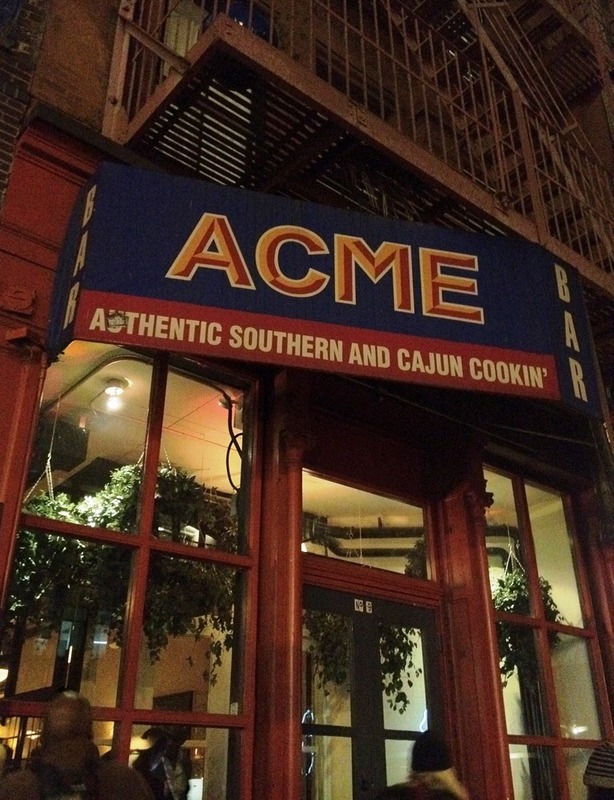 I remember feeling quite glad at that point that Acme had been closed! 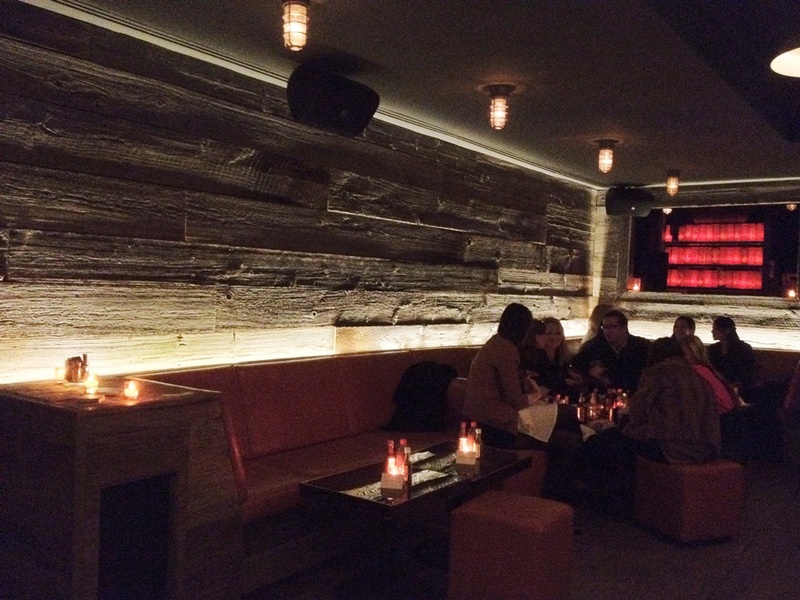 The walls in the lounge are made from huge reclaimed wooden planks. The look was rustic, but with the lighting and horizontal movement of the wood - I'd say they pulled off a modern feel at the same time. At any rate, I rather liked the whole feel. Funky, modern, comfortable. 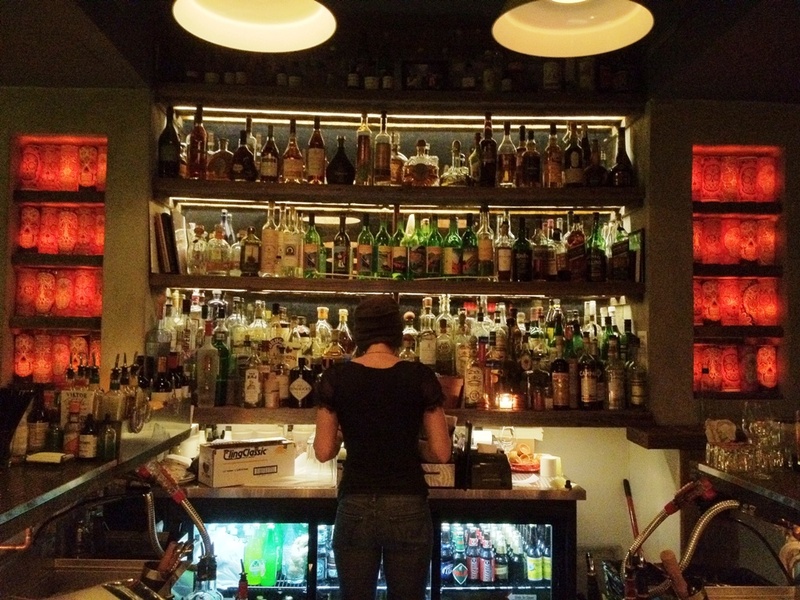 A fun hang with great libations. 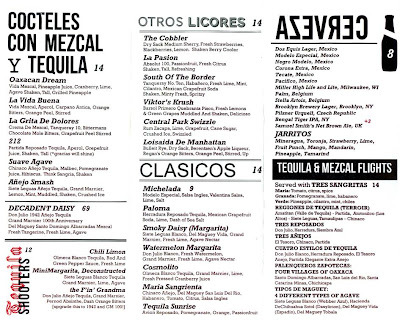 Viktor & Spoils mezcal & tequila list. This was another spot I would love to come back to. I didn't get to try their food this visit, but what I saw come out of the kitchen looked tasty! Last on this trip was actually the same place where I ended my first night in the city, a place where you should end your night at least once in the near future. Where the drinks kept coming one better than the last. A place I got happily trashed at twice, it was so nice. A place called Mother's Ruin. This place was great. Laid back, divey but still kinda nice, a little old world charm in the ceilings. Funky bathroom. Nice long bar with enough people working to take care of the crowd. An industry hang-out to be sure, but everyone who is there is there simply to have a great time. 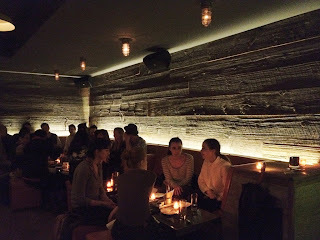 I showed up on Monday night (after some excellent German fare at Weschler's - Currywurst and Köstritzer , what a treat). It was not too early, maybe 9:00 and we were the only ones there! So we had G (Giuseppe Gonzales) to ourselves for close to an hour before things really picked up. This is certainly unusual, but it was the night before Valentine's Day and a Monday to boot...it turned out to be our good luck! I remember having a great time, being served some delicious laird's bonded based drinks, and hearing some great stories from G, but not much else to be honest. When you find a place that was that much fun, it's hard not to return quickly! So my last night before heading home I found myself back at Mother's for "one or two". 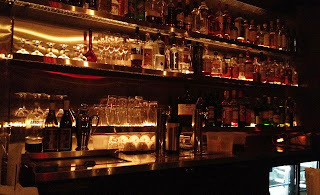 Again, I was treated to a great number of unknown drinks along with the attentions of some amazing bartenders - and again, that's about all I remember. This staff knows their stuff and how to have a great time with the crowd. 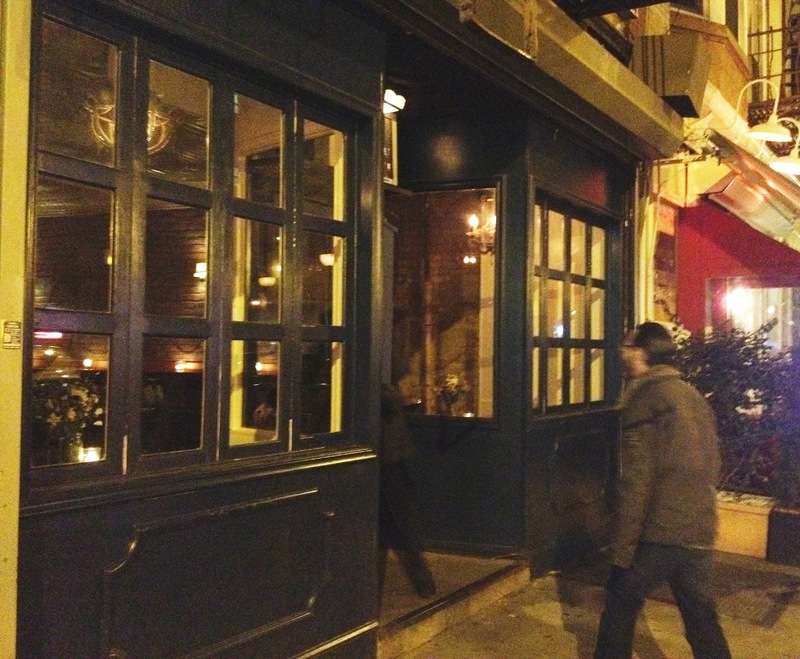 It is a perfect place to end an evening out, and a perfect place to end this post. Cheers! Measuring Up: A look at jiggers and more. 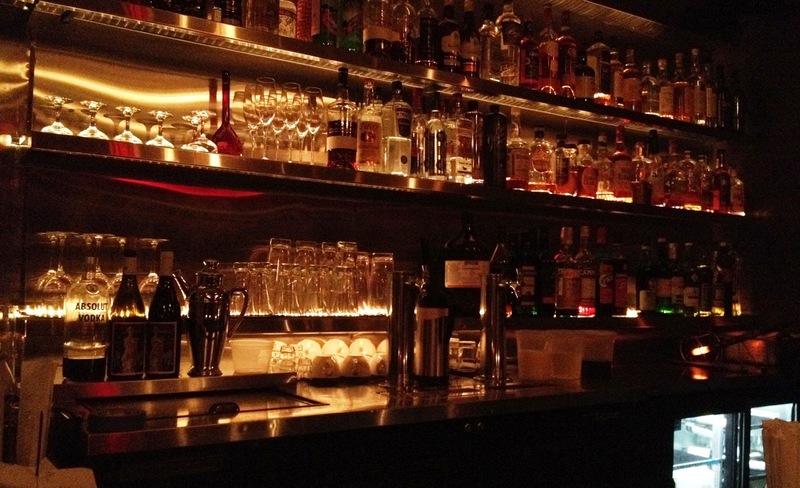 The information in this blog intended only for those of legal drinking age. Drink safely and responsibly. Copyright © 2010-2012 Ethan Bailey (unless otherwise noted). All Rights Reserved.